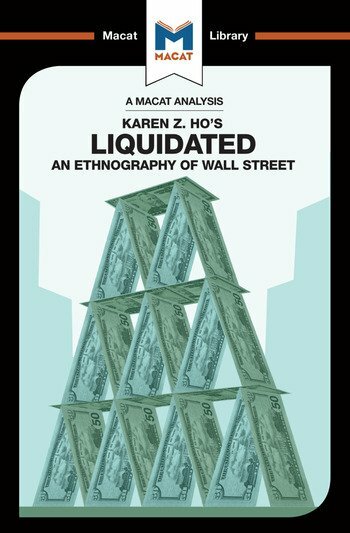 Liquidated is a work of anthropology that treats an unusual, despised subculture – that of the Wall Street banker – much as anthropologists have traditionally treated remote ‘savage’ tribes. But using the techniques of ethnography, including interviews, analysis of daily lives, and fieldwork to investigate a modern western culture is not original; what sets Ho's work apart and gives it value is her mastery of the critical thinking skills of problem-solving and creative thinking to reconceptualize the way in which we understand the bankers' mindset. Ho's great achievement is to ask productive questions, most obviously in drawing a distinction between bankers' self-image as capitalist warriors, freeing up value for themselves and shareholders by increasing the liquidity of the assets they invest in, and the social consequences of what they do. As Ho points out, not only is Wall Street institutionally inclined to embrace risk, in order to maximise profit; it is also prone to assume that increased liquidity (most often achieved by breaking up and selling off the parts of a large corporation) is a good in itself, irrespective of the outcomes for the workers actually involved in these disposals. Considering alternative possibilities, and generating fresh solutions, Ho determines that the capitalist principles that underpin Wall Street are myths, not the expression of some natural economic law..
Dr Rodolfo Maggio holds a masters degree in anthropology from the London School of Economics and a PhD in social anthropology from the University of Manchester. He is currently a postdoctoral researcher in the Department of Psychiatry at the University of Oxford.